RIO GRANDE — The University of Rio Grande and Rio Grande Community College recognized their 2017 graduates from the Holzer School of Nursing’s Hybrid LPN-RN Advanced Placement Track with a pinning ceremony Friday, Aug. 11. Dr. Donna Mitchell, dean of the College of Professional and Technical Studies, said the students have worked hard throughout the year to succeed in the program. Students who complete the two-year, five-semester Hybrid LPN-RN Advanced Placement Track will earn an Associate of Applied Science Degree in Nursing Technology. Students begin the program in the fall, taking courses over two fall, two spring and one summer semesters. All of the courses for this program are online with the exception of the clinical, which provides students an opportunity to get hands-on training experience in the field. Dr. Bonnie Allen Smith, Rio’s new nursing program director, said the ceremony signifies the students have successfully fulfilled the program requirements. The event was Allen Smith’s first experience at one of Rio’s nursing pinning ceremonies. She said she enjoyed seeing the students’ excitement and watching them light candles, a significant part of the ceremony with a long history. For more information on Rio’s Holzer School of Nursing, contact the Office of Admissions at 740-245-7208. 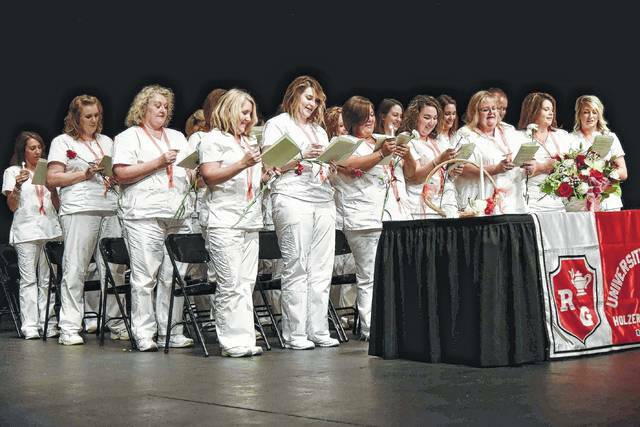 The recent graduates of the Holzer School of Nursing’s LPN-RN program participate in the traditional candle lighting during the pinning ceremony for recent graduates of the Hybrid LPN-RN Advanced Placement Track.